Nigeria is a West African country that has a relatively warm climate, with temperatures ranging from 43 to 111 degrees F, according to the Country Studies website. Climate conditions vary across the Nigerian countryside, with cooler temperatures and higher average rainfall on the coastal regions and dryer temperatures inland. The climate, generally defined by the dry and rainy periods, allows for a diverse variety of flower types. The bird of paradise is a common flowering plant found in Nigeria. The bird of paradise, a native to South Africa, gets its name from the brightly colored flower that it produces, which resembles a brightly colored bird. According to the University of Florida, the bird of paradise grows well in temperate to hot climates and can withstand temperatures as low as 24 degrees F for short periods. The flower is popular in the warm Nigerian climate because it can grow in nearly all well-drained soil types, with little maintenance. The University of Florida states that there are no serious pest threats to the flower, but occasionally aphids, caterpillars, grasshoppers, scales and snails attack the plant. 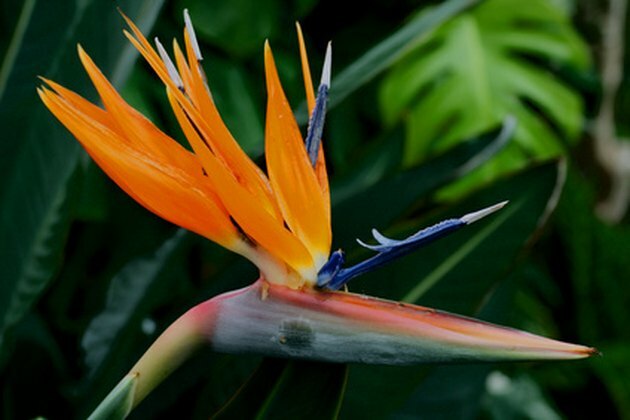 Fungal leaf spot also infects the bird of paradise; however, the fungal disease rarely does serious harm to the plant. The Coctu spectabilis or Costus spectabilis is the national flower of Nigeria and is one of the most common. The flowering plant, identified by its bright yellow flowers surrounding its four leaves, is part of the spiraling ginger family. The spiraling ginger plant, grown worldwide, comes in many different colors and flower shapes. The Coctu spectabilis has a height of around 5 inches with a spread of the same length, states Flora of Zimbabwe. Although the plant flourishes in the warm Nigerian climate, it is susceptible to a variety of pests, diseases and environmental issues. The Mimosa pudica, or sleeping grass, is a common flowering plant found in Nigeria. According to the University of Miami, the perennial Mimosa pudica can grow to heights of 5 feet with a spread of 3 feet. The plant gets its name from the reaction it makes when touched or provoked. The leaves close up when touched to appear dead or unappetizing to predators; this works as a sort of self-defense mechanism. The plant grows best in temperatures between 60 to 85 degrees F and in moist, well-drained soils, states the University of Miami. In some areas the Mimosa pudica is considered a weed, but in others, it is thought of as a decorative ornamental flowering plant.